Did the Christ Child know his crucifixion was coming? There was a theological purpose in these paintings of the Christ Child, in scenes that evoked his coming passion. Christian artists were grappling with the meaning of the passion, which they felt could only be revealed by seeing the whole of Christ’s story as seamless. One could say that they did on canvas what the evangelists did with words. 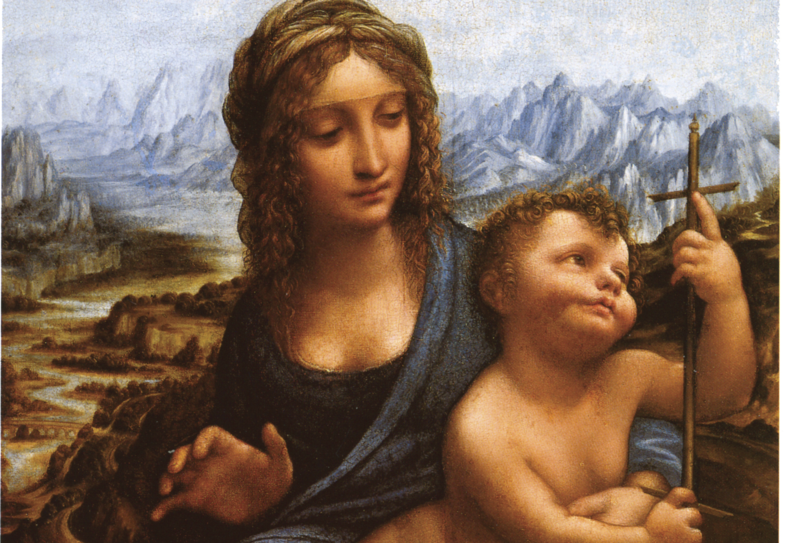 In Leonardo’s painting, the Blessed Virgin Mary is shown with the Child Jesus. He is sitting on her lap. There is a marked resemblance between mother and child. Both have curly, auburn hair. For a toddler, Jesus is surprisingly robust—his face a bit more mature than that of other children. Leonardo is foreshadowing the man who would come forth from the child. There was a theological purpose in Leonardo’s paintings of the Christ Child, in scenes that evoked his coming passion. The little picture he is working on is of a Madonna who is seated as if she were about to spin yard and the child has placed his food in the basket of yarns and has grasped the yarnwinder, and stares attentively at the four spokes, which are in the form of a cross, and he smiles and grips it tightly, as if he were longing for this cross, not wishing to yield it to his mother, who appears to want to take it away from him. Our eyes swirl counterclockwise as the narrative continues with Mary’s motions and emotions. Her face and her hand indicate anxiety, a desire to intervene, but also an understanding and an acceptance of what shall be.... She reaches out nervously, as if trying to decide whether to restrain him from his fate. In his masterpiece Jude the Obscure, the novelist Thomas Hardy created a precocious child, whom he called “Little Father Time.” Although his family is dying from the poverty brought about by the immaturity of his parents, Jude and Arabella, their son, Little Father Time, is preternaturally mature. Only a child, he sees and speaks with the complexity of a world-weary adult. This is not what artists are trying to suggest in their paintings of the Christ Child, which foreshadow his crucifixion. They do not think that the toddler walked around looking for the future implements of his torture. The great masterwork of Christ would be his death on the cross. No, they simply want to suggest the profoundly Christian conviction that what would happen in the future was what had to happen in the future. When and how Christ knew this, we cannot say, though the Gospels make it clear that he did. He foresaw and freely embraced his fate. Why does this matter, even today? Especially today? Many of our contemporaries have reduced Jesus to the role of a moral reformer. They do not view themselves as essentially sinful, as alienated from God, and, consequently, they have no need to think of Jesus as a savior, one who embraced death, the fullness of alienation from God, on our behalf. But consciousness of sin is itself a work of grace. Only when we have been truly touched by God do we recognize how far we are from God, how alienated we are. That our contemporaries do not understand themselves to be separated from God does not mean that they are not. Ironically, the early church was convinced that this self-complacency was the surest sign of alienation! Only those who have been touched by grace can recognize the effect of sin in their lives, can recognize their need for a savior and, consequently, can recognize why Christ had to die on the cross. Like so many other artists, before and since, Leonardo suggests that what did happen is what had to have happened. For these artists, the abhorrent cross is the revelation of God’s own artistic genius. Its form is too flawless, too complete, not to be embraced as an absolute expression of truth and beauty: God would undo death by means of death. His Christ would do this consciously, willingly. The great masterwork of Christ would be his death on the cross. Therefore, like a masterpiece, every element of his life was ordered to this end. Philippians 2:5-7 Have this mind among yourselves, which is yours in Christ Jesus, 6 who, though he was in the form of God, did not count equality with God a thing to be grasped, 7 but emptied himself, taking the form of a servant, being born in the likeness of men. Or, as Venerable Fulton Sheen (and a Council or three) used to put it, "there was in Christ one Who and two Whats." Of course, He knew, otherwise His emptying would have been an incomplete surrender and not an adequate reflection of the Divine Person He is. Who can say with absolute certitude that, the Child Jesus knew He was destined to the Cross? However, I personally believe Jesus did not know His destiny early on as Man, otherwise how could he be "truly Man" as we as children do not know our destinies? There can be a few exceptions in that, a child who early on shows artistic and other human skill may recognize his particular destiny early on. However, with Jesus, there can be no doubt that Jesus as "truly God" knew even from the womb and I dare say before conception, His destiny, including the Cross, information shared with the Trinitarian God, Father, Son, Holy Spirit. For mankind destiny develops gradually and in most cases we remain free to turn away from it. The genius of Jesus resides in the fact that once He recognized it, He accepted it. Thank You, Jesus! I don't know whether Jesus the child anticipated his crucifixion, but the Crucifixion "had" to happen because Jesus spoke the truth. Those who speak the truth are routinely crucified, so Jesus had to show us how to deal with crucifixion. If he had not shown us how to deal with crucifixion, we would not be able to effectively evangelize.